William "Billy" John Dwyer of Salisbury could fix anything with duct tape, wire and a soldering gun, but couldn’t mend his body. He died March 17, 2019 at 83 after surviving many near misses, including a runaway skidoo, an oncoming passenger train and a charging bull. 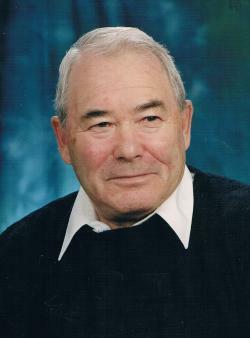 Billy is survived by his loving family: wife Melda of 54 years; daughters Erin (Tim) King of Hampton and Natalie (Merv) Edinger of Dartmouth; favourite sister Andrea Dwyer of Sussex; grandchildren Jacob, Sam and Ethan King, Sarah Armstrong and Jon Edinger; and great grandchildren Ava and Jackson Armstrong. He was predeceased by his parents, Marion (Kearns) and Andrew Dwyer, two poodles, three knees and his home built El Camino. Born in New Glasgow, NS, Billy left home at 17 to work for Eastern Woodworkers in Gander Nfld. He also worked as an underwater welder and as a survey technician with the Town of New Glasgow before beginning his career with the CNR in 1966. In 1968, he was transferred to Moncton, making a home with Melda on Granite Drive in Salisbury where he met a band of fun-loving neighbours who remained lifelong friends. He retired from the CNR in 1993, and launched with Earl Smith Railway Consulting Services, which operated for 17 years. He enjoyed many things – hunting in Elgin, fishing on Grand Lake, scuba diving, ice cream, wood carving, clam boils at Melmerby, lobster and a drink of rye. He could fix anything - from cars to computers and electrical appliances – and stockpiled parts for any situation. Tremendous thanks for the wonderful support goes to the nurses and staff at the geriatric ward where Billy spent the last five months. Resting at Salisbury Funeral Home, 3350 Route 106 (372-4800) from where visiting hours will be held Thursday, March 21, 2019 from 2-4 and 7 – 9 pm and from where parish prayers and sharing of memories will take place at 8:30 pm. Funeral Services will be at St. Jude’s Catholic Church in Salisbury on Friday, March 22, at 11 am. Interment at Our Lady of Ransom Cemetery at a later date. The family would appreciate a scent free environment at the visiting hours and funeral service. Memorial donations can be made to Parkinson’s Canada or Salisbury Helping Hands Inc. Food Bank.